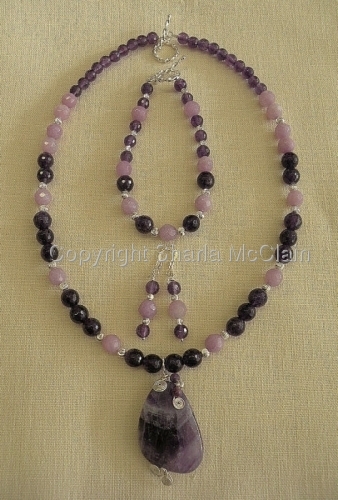 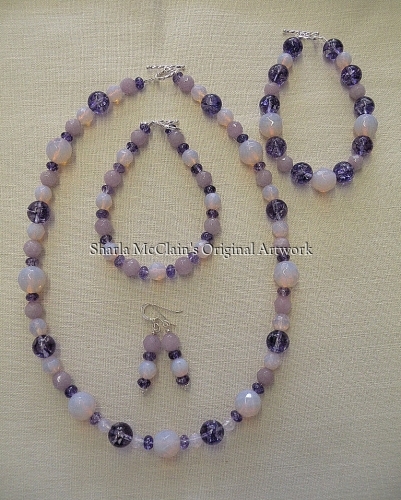 Amethyst wrapped pendant Necklace, Bracelet and Earrings , Sterling Silver, Clasps, Wire & Spacer Beads. 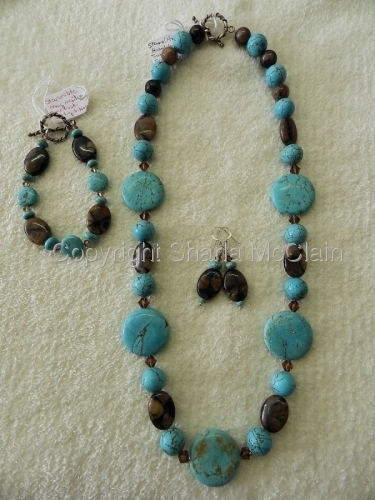 Necklace, Bracelet & Earrings have Sold. 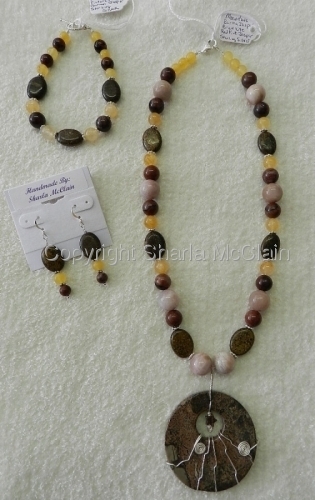 Kambara Jasper, Yellow Jade, Necklace, Bracelet and Earrings. 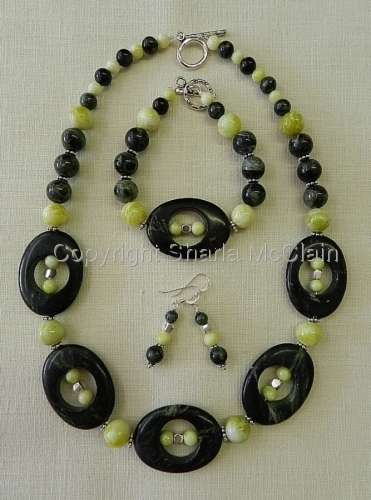 Sterling Silver Clasps, Earwires, and Spacer Beads. 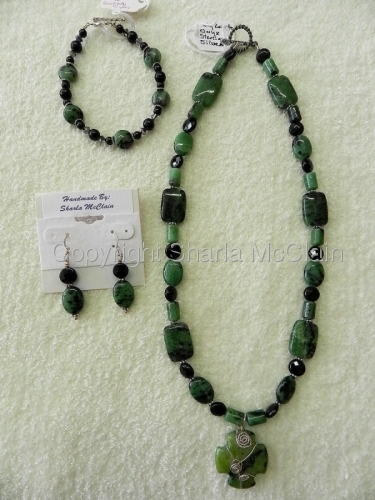 Kambara Jasper Necklace, Bracelet, Earrings Set(kjyj08nset) Save $6.50 on Set! 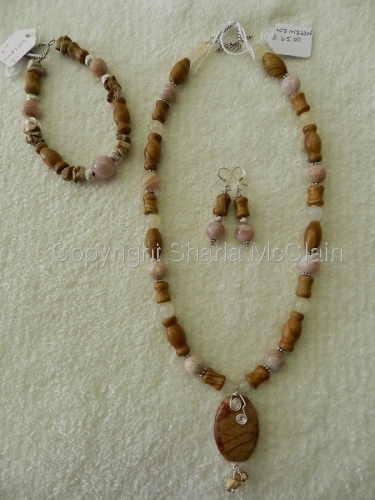 Pink Opalite is a man made bead. 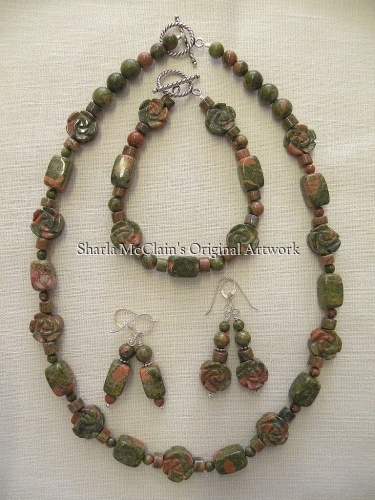 Unakite Necklace, Bracelet, and Earrings with Sterling Silver clasps and earwires. 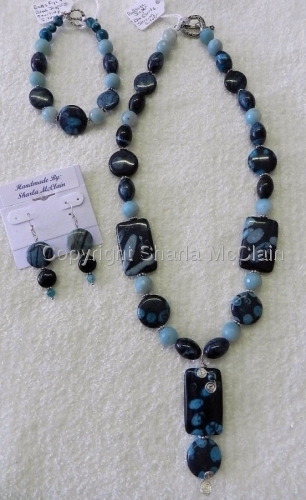 Set, Necklace, Bracelet Earrings(qadam9set) Save $10.00! 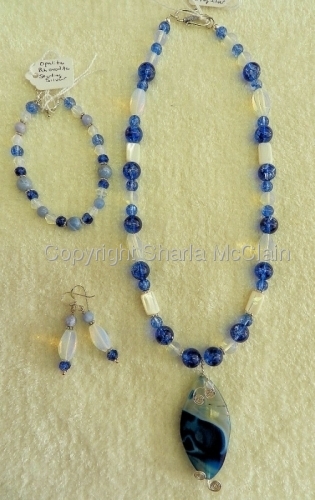 Necklace w/Agate Pendant, Bracelet & Earrings made of Opalite (man made), Dk Blue Crackled Quartz & Blue Rhonodite beads w/Sterling Silver Clasps, Spacer Beads, Wire & Earwires. 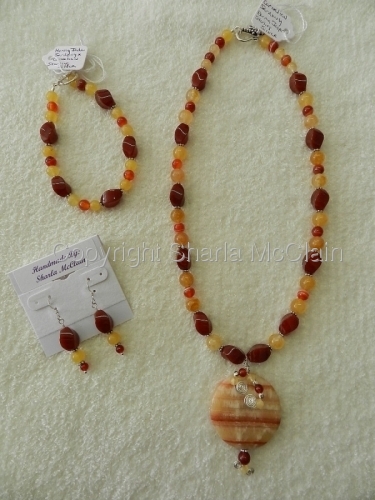 Necklace & Bracelet are Sold. 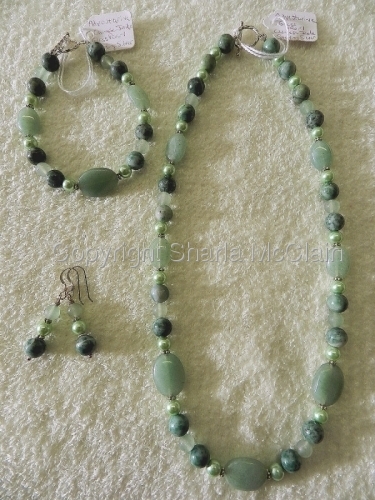 Necklace, Bracelet & Earring Set, Adventurine, Glass Pearls, Chinese Jade(apj18nset)Buy Set & Save $7.50! 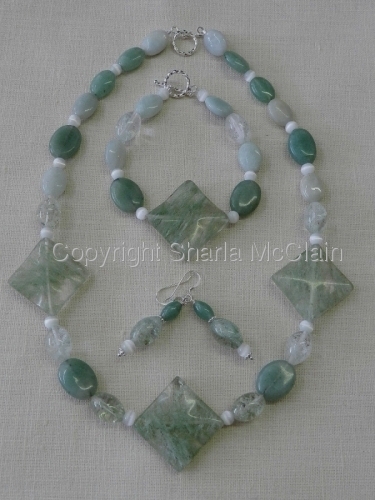 Necklace (22"), Bracelet & Earrings made with Howlite, Magnesite (Howlite & Magnesite are naturally white with veins, beads have been dyed to look like turquoise). 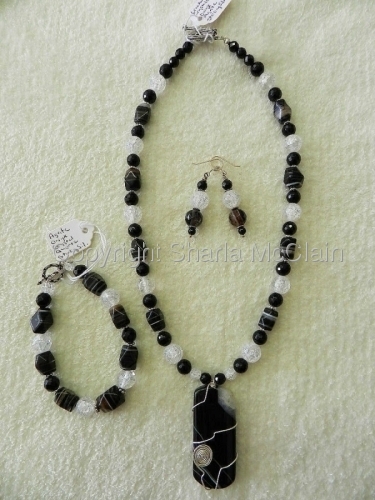 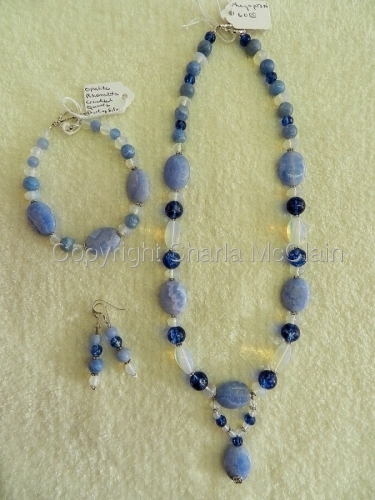 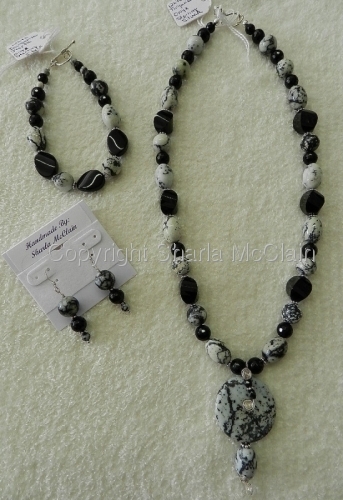 Staurolite and Swarovski Glass Beads have also been used in this set. 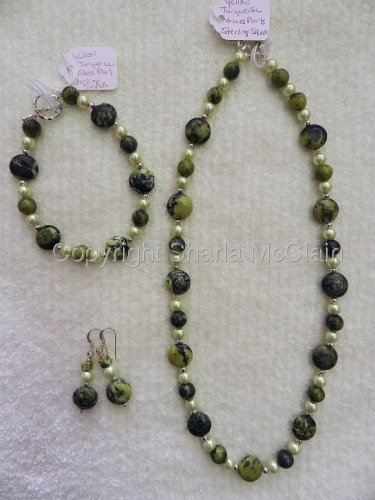 Sterling Silver, Clasps and Earwires. 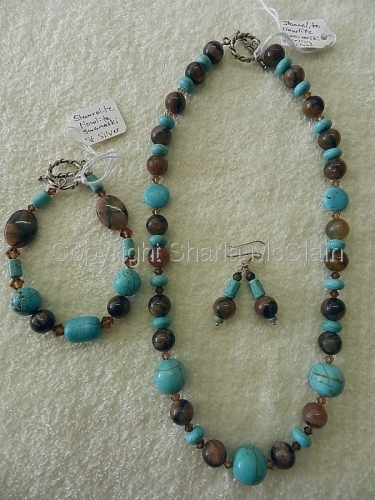 Necklace, Bracelet & Earrings, made of Howlite (dyed to look like turquoise), Staurolite,Swarovski Glass Beads, w/Sterling Silver Clasps & Earwires.